The British pound doesn’t cease surprising. Its response to the defeat of Theresa Mays’s divorce plan in the UK Parliament gets the bears to regret. Those, who expected the GBP/USD drop down to 1.15, counting on no-deal Brexit, have to look for arguments to justify themselves. 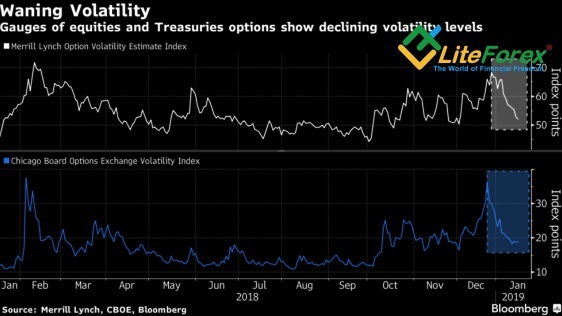 The markets signal the sterling bullish outlook: volatility declines, call options premiums are up to 7-year high. Many will close with profits if the pound goes up to $1.35 and higher. The fact that the UK Prime Minister managed to defeat no-non confidence motion and is now preparing a plan B at the beginning of the week ending January 25, only partially can explain the pound steady growth. Even if the EU won’t make concessions and is now announcing higher risks of messy Brexit, but, in fact, the GBP trend will be determined in London, rather than in Brussels. Article 50 of the Treaty of Lisbon gives any EU member state the right not to set a particular withdrawal date; therefore May 29 is not a doomsday for the GBP/USD. Furthermore, the rejection of plan A by policy-makers increases the chances for soft Brexit or the second referendum on the EU membership. The members of parliament perfectly understand the results of messy Brexit, therefore, the plan of custom union or maintained access to the single market is still to be discussed. BNP Paribas believes that the chances of the second referendum are higher and forecasts the pound rally up to $1.36, According to the last polls of YouGov, the number of the British people who want to stay in the European Council is sharply increasing. It seems that most of the negative has already been priced in the sterling rate, and the reversal risks (the difference between premiums of call and put options) signal that the GBP situation will improve. In fact, uncertainty remains, pressing down the UK PMI, setting back the business investments and the UK GDP rate. Therefore, those, who claim that the divorce deal will get the Bank of England to raise the interest rate as early as at the first meeting after the historical date, are wrong. It is more likely that BoE will wait and see amid the slower inflation growth. This fact encourages Merian Global Investors to suggest a limited potential for the GBP/USD rise. According to the company, the pair should rise by 5-8%, rather than to return to the levels, recorded before the referendum in 2016. In my opinion, the wait-and-see approach to trading GBP/USD is still relevant. Pound bullish outlook is getting more distinct, which, amid a long pause in the Fed monetary normalization, increases the chances for an uptrend emerging. Nevertheless, it is not safe to enter longs without a considerable improvement of the UK political environment. That is why it will be relevant to buy GBP/USD at from levels, lower than the currently traded ones, or from a level, higher than 1.3.